Some travel mavens extol the virtues of travel insurance; others call it a waste of money. Who’s right? Both are—depending on individual and trip circumstances. Here are our rules about buying travel insurance. Chances are you may, at some time, have to cancel a trip after you've already booked and paid or have to return home after you've already started a trip. It could be because you fall ill or suffer an accident, or due to a problem arising with a traveling companion or a close family member at home, or due to supplier default. Trip-cancellation insurance (TCI) reimburses you for non-recoverable deposits and penalties if you have to cancel before you start; trip-interruption insurance (TII) covers the extra costs of returning home early or of continuing solo if your traveling companion has to return early. TCI and TII are almost always sold together in a bundled-package policy. When to Buy: Buy TCI/TII any time you have more advance payments at risk than you can comfortably absorb if you have to cancel the trip. This risk is especially great with vacation rentals, cruises, and package tours, where you might lose your entire payment if you cancel shortly before departure. The corollary to this rule is equally obvious: Don't pay to "insure" recoverable payments. All TCI/TII is secondary, meaning the insurance pays off only after you've first claimed all other refunds, including credit-card refunds that might be coming to you after your trip is canceled. What to Buy: TCI/TII covers only what's in the policy, so you have to read the fine print carefully on any policy you're considering. Policies differ substantially in "covered reasons" and "named perils" that form the basis for allowing any cancellation or return. If an event or condition isn't specifically listed, the policy won't pay. If there's any risk that you might want to cancel a trip for a reason that isn't covered or named—especially work-related reasons or general uneasiness about a destination—buy an additional "cancel for any reason" or "work reason" policy. Those policies are more expensive and some don't pay 100 percent of your exposure, but you get to decide whether to cancel rather than some insurance-company bean counter. Nobody is immune to sudden sickness or accident, and if either occurs while you're out of the country, you may need medical insurance to cover possible doctor visits, hospitalization, and emergency transport home. Medical-evacuation services (provided by "medevac" policies) pay for these expenses. When to Buy: You probably need medical-evacuation insurance if your regular health insurance doesn't cover you adequately when you're out of the United States. That includes everybody on Medicare plus many others. What to Buy: As with TCI/TII, buy only what you need to plug the gaps in your regular health/medical coverage. 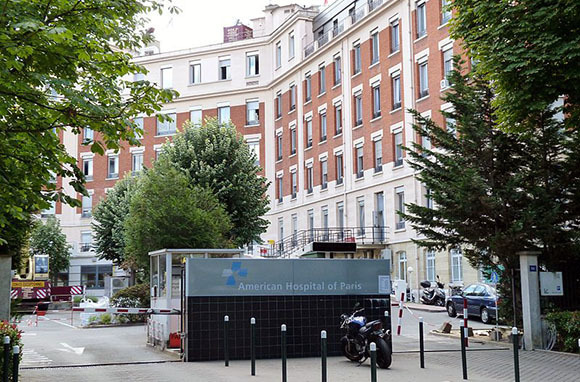 Some U.S. health-insurance policies and HMOs cover foreign travel; others don't. If you're traveling outside the U.S. and your regular health insurance doesn't cover foreign travel, buy a medical-evacuation policy. Medicare doesn't cover any expenses outside the U.S., and even supplements that do cover foreign expenses—Plans C, D, F, and G—impose a low deductible of $250 per year that wouldn't take care of a serious problem. Look for a primary medevac policy where you can. Primary medevac coverage pays medical bills up front, and that's enough of an advantage that you might want to consider it even if your regular insurance covers foreign travel. 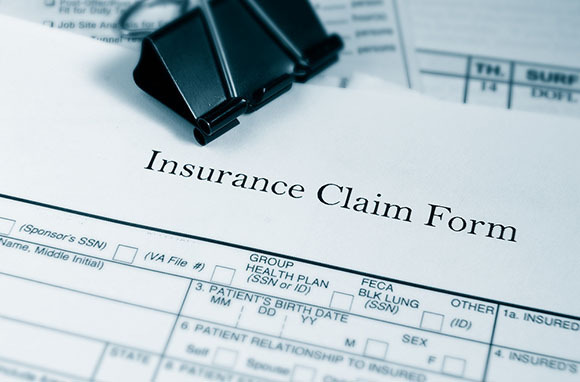 However, most policies are secondary, meaning that you have to pay for the medical services up front and later file a claim for reimbursement. As with TCI/TII, medevac coverage is limited to "covered reasons" and is subject to exclusion for preexisting medical conditions. Almost all TCI/TII coverage is part of a bundled insurance package that also includes a laundry list of minor coverages: personal-property loss/theft, delay expenses, baggage damage/loss, and such. 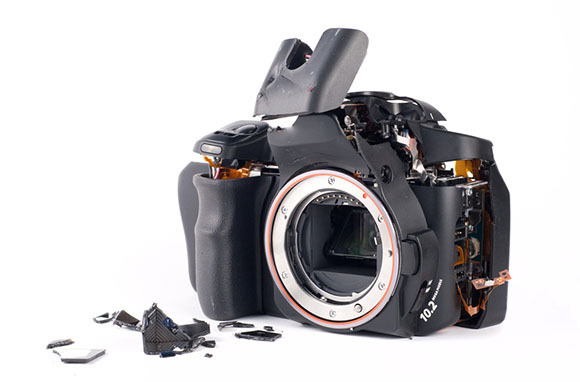 When to Buy: Typical bundled minor coverages include loss/damage to personal property for high-risk items that airlines won't cover, including cameras and various electronics and tech items, but often with a dollar ceiling. Consider a travel policy if your regular personal-property insurance doesn't cover these items. What to Buy: Don't pay a lot extra for these minor coverages. Many such policies are secondary—paying off only after you've made all the other claims available to you—and presumably you already have primary coverage from a variety of other sources. Your regular year-round personal-property or homeowners' policies typically cover your personal property while you're traveling, airlines and cruise lines are responsible for baggage loss/damage, and your credit card may well cover you for delays. As with almost all such insurance, the policy covers only depreciated value, not replacement cost. 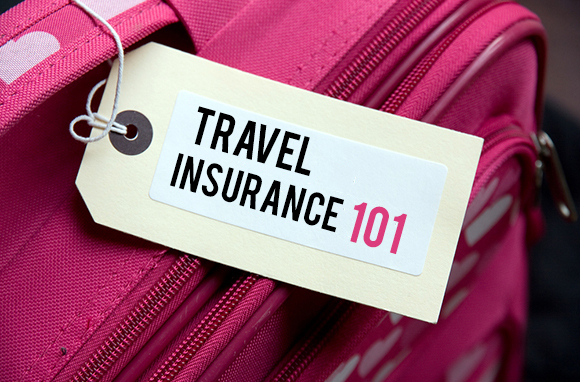 Most travelers buy their insurance in bundled policies that combine TCI, TII, medevac, and minor coverages. Medevac is available for purchase separately (in six-month or yearly policies for frequent overseas travelers). When to Buy: If you're going to buy, buy immediately (within one to two weeks, depending on the policy) after your first payment. That way, you can avoid hassles about medically-based cancellations that an insurance company might otherwise be able to blame on a preexisting condition. What It Costs: Prices for bundled policies and separate medevac policies depend on destination, duration of trip, and your age. They range from 5 to 15 percent of your total trip cost, sometimes even more for very senior seniors. SmarterTravel recommends that you buy through one of the several independent online agencies that specialize in travel insurance (see Travel-Insurance Agencies). They all provide comprehensive search systems where you enter personal information, trip particulars, and the coverages you want, and the system displays all of the policies that meet your needs, with their prices. 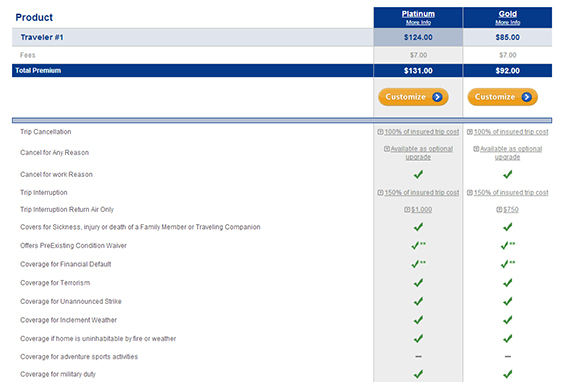 Obviously, you will generally want to buy the cheapest policy that works for your trip. Don't blindly accept a travel agent's recommended policy. Many agencies handle policies from only one supplier, and those policies may not offer the best choices. If you're 65 or over, look for a policy that doesn't base the rate on your age. Age-rated policies can be expensive—very expensive if you're 75 or over. What to Avoid: Unless you can't afford third-party TCI/TII or medevac from an insurance company, don't buy a tour operator's or cruise line's "cancellation waiver." People sometimes call it insurance, but it isn't: Instead, the cruise line or operator agrees to waive its own cancellation penalty. But those waivers cover fewer risks, and many limit reimbursement to a credit toward a future booking rather than a cash refund. Similarly, don't blindly accept a travel supplier's "opt in" insurance option. It may be more expensive than an independent policy, or its coverage may be more limited than you need. The only reasons to consider waivers or opt-in insurance are if you're in your 70s or 80s (and age-rated prices of bundled policies are too high) and the prices for the opt-in insurance or waiver aren't age dependent, or if the amount of money at risk isn't large enough to warrant a full independent policy. Once you've started your trip, you have to play by the rules. Making a Claim: Follow the policy instructions in making a claim. Don't "wing it" and expect to be reimbursed, especially when you're already on your trip and need medical services or an early return. Notify the insurance company of your situation immediately and ask the company's representative how to go about making whatever arrangements are necessary. If you bypass that procedure, the policy probably won't pay. 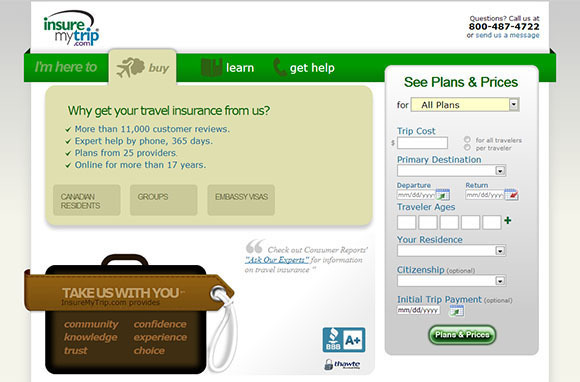 Be Realistic: Like most insurance, travel insurance is about money, not experience. Travel insurance can recover nonrefundable payments and cover unexpected emergency expenses, but it can't rescue a ruined trip. You might have to rearrange the trip all over again—but, if things go well, you'll have money to pay for it.